Group of specially heat-treated cast iron materials. ADI is the abbreviation of “Austempered Ductile Iron”. According to German standardization it is referred to as “Bainitic nodular graphite cast iron”, although it does not contain any bainite, which can be defined as “non-lamellarferrite-carbide aggregate”. In Europe, the material is standardized according to DIN EN 1564 and in the USA to ASTM A897. The ausferritic microstructure is achieved by heat treatment; i.e. needle-shaped ferrite that is present in a carbon-supersaturated matrix (s. Ausferrite). In addition, carbon continues to be present in the form of nodular carbide (Fig. 1). Heat treatment includes austenitization, quenching, and transformation within a temperature range between approx. 400 and 240 °C. The sequence is schematically illustrated in Fig. 2. According to the curve sections A-B-C, the casting is austenitized at 840 to 950 °C, then it is quenched to the selected transformation temperature from 230 to 450 °C. Quenching must be performed fast enough to make sure that pearlite or ferrite diffusion is prevented prior to reaching point D. From point E, transformation is started by diffusion of acicular ferrite. The carbon displaced by ferrite diffuses into the austenite, so that the austenite becomes richer in carbon and thus more stable. This phase is completed at point G, where the carbon content in the austenite amounts to 1.8 to 2.2 %. Thus, the austenite is absolutely stable even at low temperatures, similar as in high-alloy special steel. If transformation is discontinued before reaching point G, the austenite is unstable and may transform to martensite during cooling or under mechanic stress. This increases hardness and wear resistance, on the one hand, but also involves machining problems, dimensional changes and, above all, loss of toughness, on the other hand. 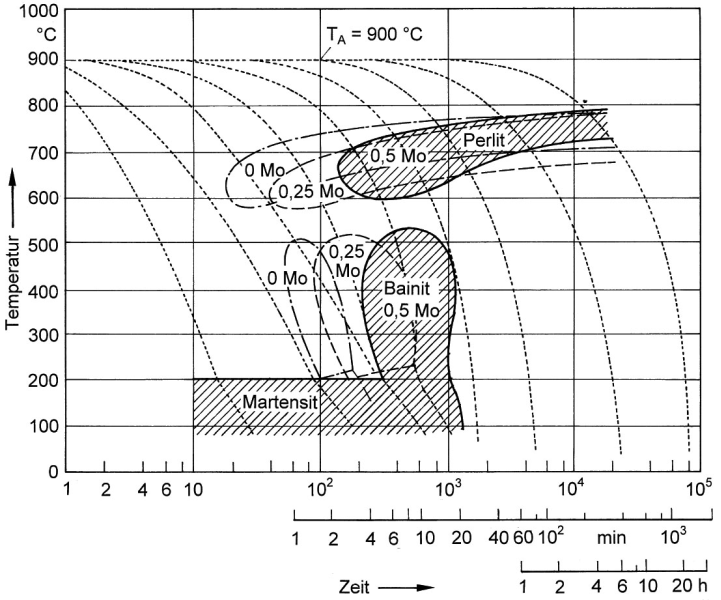 If during heat treatment the casting is held at transformation temperature beyond point G, Fig. 2, the austenite is no longer capable of keeping the carbon content in a dissolved state so that carbide nucleation cannot is initiated. Finally, the entire austenite is transformed to ferrite while almost all of the carbon content is diffused in the form of bainitic ?-carbides. Then, the casting has a ferritic-carbidic matrix that corresponds to conventional bainite in heat-treated steel (see tempering). This only has little influence on strength but toughness is significantly reduced. The transformation sequence with its two-stage reaction, which largely differs from that of conventional steel, is caused by the silicon content in the cast iron, which initially suppresses diffusion of the carbides typical for bainite. The same structure can be generated in nodular graphite cast iron or vermicular graphite cast iron and in melleable cast iron. Even if steel is alloyed with a sufficient amount of silicon, the transformation taking place is the same as in cast iron. With decreasing transformation temperatures, the ADI matrix becomes increasingly fine which, in turn, causes an increase in strength. As a consequence thereof, elongation becomes less. This interdependence is illustrated in Figures 3 and 4. Bainite formation, or better ausferrite formation, may take place during normal cooling of the casting inside the mold, provided that pearlite formation can be securely prevented. For this purpose, nickel contents are provided for displacing the pearlite peak from the normal cooling range and to relocate the interstitial region in the direction of slower cooling speeds (s. Bainite, Fig. 1) as illustrated in the TTT diagram. 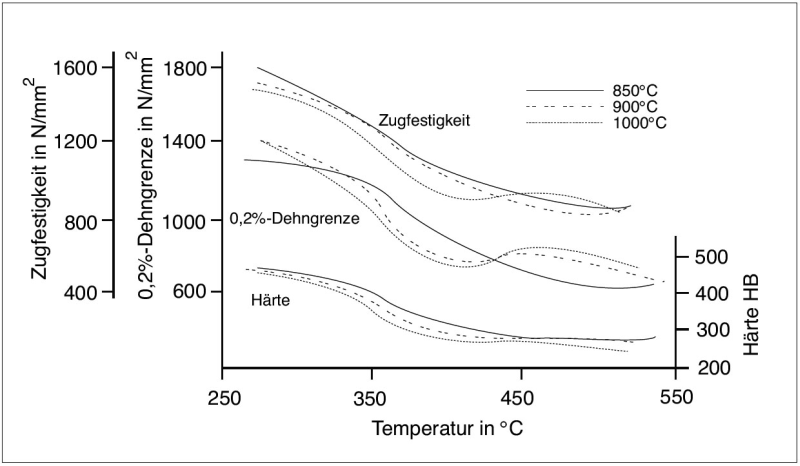 Since cooling speeds also depend on wall thicknesses of castings, nickel contents or contents of alloy elements in general must be calculated accordingly (Fig. 5). At the same time, molybdenum contents of approx. 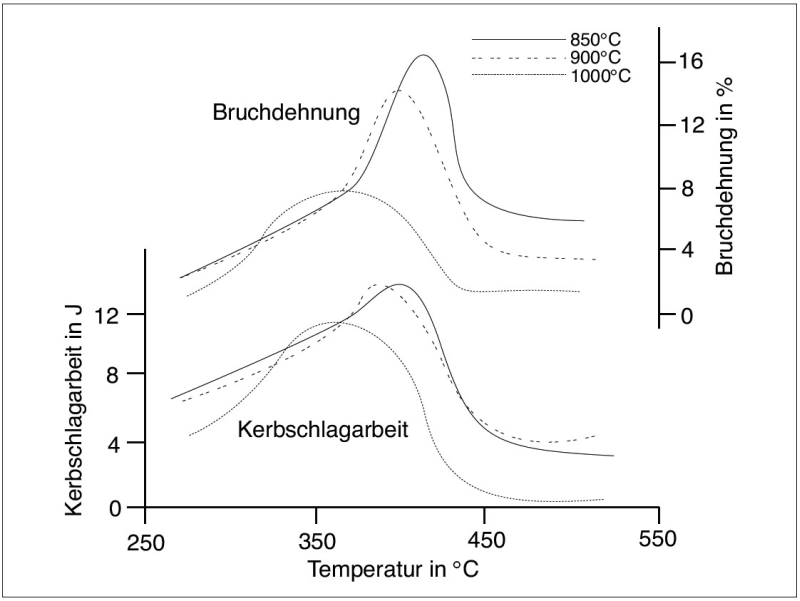 0.5 to 0.8 % are provided in order to lower the martensitic transformation temperature and further dislocate the pearlite peak from the endangered cooling range (Fig. 6). In this way it is possible to achieve the required strength level or grade in accordance with DIN EN 1563. However, it is not as easy as that, since the precise temperature-time combination, i.e. 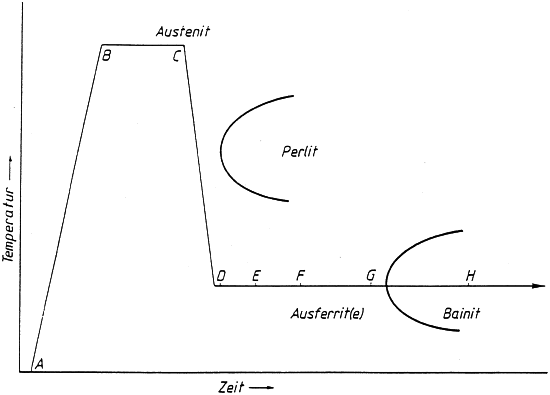 the so-called process window, depends on the composition of austenite at the beginning of transformation. Increased carbon content and all the conventional alloy elements extend the hold time until stable austenite is achieved at point G. Consequently, the two major influential, factors are the carbon content of austenite, which depends on austenitization conditions, and the alloy content, which is predominantly determined by full-hardening capacities required for the respective wall thickness and by the raw materials available. The composition of alloys, including the silicon content, as well as the initial structure of the casting likewise have an influence on carbon absorption during austenitization. This results in rather complex interdependencies. While production of high-strength grades, such as GSJ-1400-1 and 1200-2 is relatively simple, the two high-toughness grades, GSJ-1000-5 and particularly GSJ-800-8 present greater difficulties, since it is often not possible to achieve the required elongation. Segregation of alloy elements, including silicon and manganese, represents a special problem in this context. Manganese and molybdenum segregate into the residual melt and thus also into the grain boundaries, while silicon, copper, and nickel accumulate in the proximity of the graphite nodules. Segregations become more and more distinctive with lower nodule counts and slower solidification speeds. Hence it could be claimed that the casting virtually consists of two different alloys: one with an increased silicon, copper, and nickel content in the proximity of the graphite nodules and one that is enriched with manganese and molybdenum along the grain boundaries. 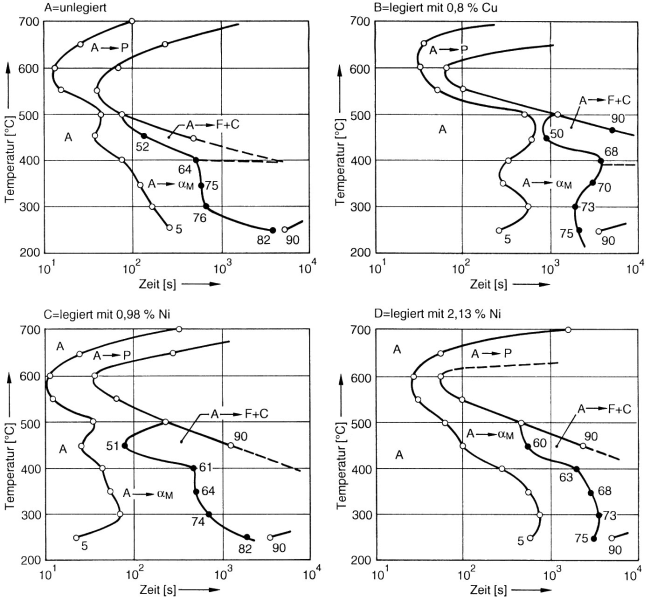 Since the hold time depends on the austenite composition, as was mentioned above, the process window differs for the two elements both for austenitization and, above all, for transformation to austempered ductile iron (ADI). Manganese, in particular, delays transformation very much. Thus, with hold times that keep the rest of the structure within the ausferrite range it is not possible to stabilize the austenite along the grain boundaries, so that martensite is easily formed and toughness properties are deteriorated. This phenomenon is often accompanied by carbides so that in addition to lack of toughness, machining properties are also worsened. The segregation behavior of manganese and molybdenum results in a vicious circle. 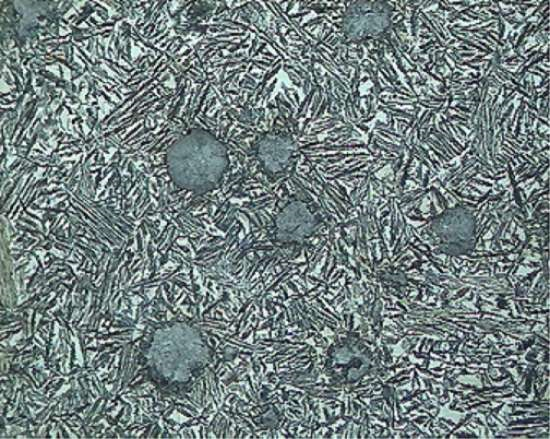 In thick-walled castings, alloy elements are required to achieve hardenability (here: bypassing the pearlite peak); but they involve higher degrees of segregation due to their lower solidification speeds. Feasible remedial measures against grain boundary segregation are as low a manganese content as possible and preferably high nodule counts achieved by good inoculation (s. Inoculation). The use of molybdenum, which was considered the preferred element for increase of hardenability in the seventies, is nowadays limited more and more and contents are recommended to be 0.2 % or lower. Instead, copper and nickel are used as alloy elements with nickel gaining more and more importance. Copper is not soluble in ferrite, at all, and only provides limited solubility in austenite so that it results in hardening and embrittlement during transformation to ausferrite. In addition to that, copper is also capable of delaying carbon solution during austenitization. Nickel, on the other hand, has the least affinity for segregation, is easily soluble in ferrite and austenite, and even increases the solubility of copper. Modern ADI compositions with high hardenability thus contain a maximum of 0.2 % Mn and Mo, up to 0.8 % Cu, and between 0.7 and 2 5 Ni, depending on required hardenability. However, these types of alloy compositions are not exactly cheap.